At The Grimms, as well as having fun putting on shows and concerts, an important part of what we do is raising money for charity. This is the current list of the money we have managed to raise through our shows and concerts and the help and support of our loyal audiences over the years! Trish was our secretary for many years and is sadly missed by us all. 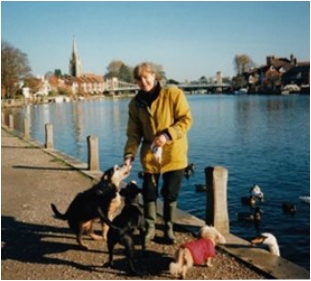 There is now a wonderful memorial bench in Higginson Park, Marlow in memory of her. It is in a popular location just below the steps of Court Garden, to the left of the statue of Sir Steve Redgrave with a lovely central view over the flower beds and river beyond. Both Paul and Pete (her sons) cycled 100 miles in aid of Sue Ryder and raised over £2,000 which is fantastic.